We call it the Goanna highway but it’s basically one of the only access routes from the sand dunes in front of our place through to the other side of our block. Lace monitors both juvenile and adults wander through at all times of the day. We stay out of their way admiring their intricate patterning and they stay out of ours by skirting around the kids toys. 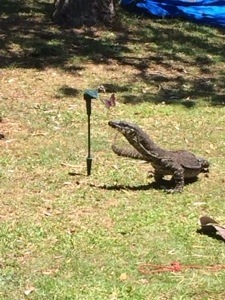 So when one particularly large specimen decided to take a liking to my daughters solar butterfly garden ornament we all gathered around to watch him in action.